A real highlight was visiting the Library of Congress (first seen in the film National Treasure 2), and the collection of wisdom located there. We expressed some sadness as we In this Library at least, we were seeing wisdom being prized and idolised for its own sake – not acknowledging that it comes through a gracious God (James 1:5, Proverbs 1:7), and is fulfilled in Christ (1 Cor 1:30). 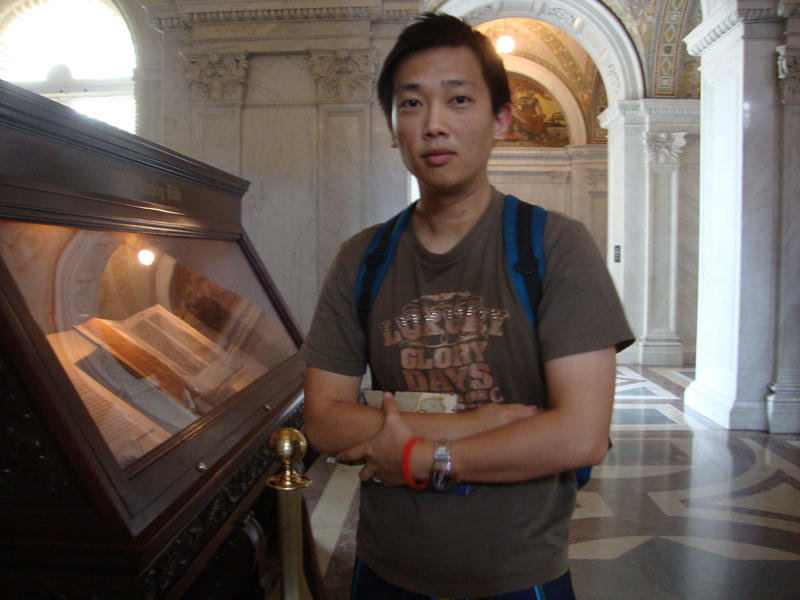 The Library of Congress did have a perfect copy of a Gutenberg Bible on display, which was pretty neat. 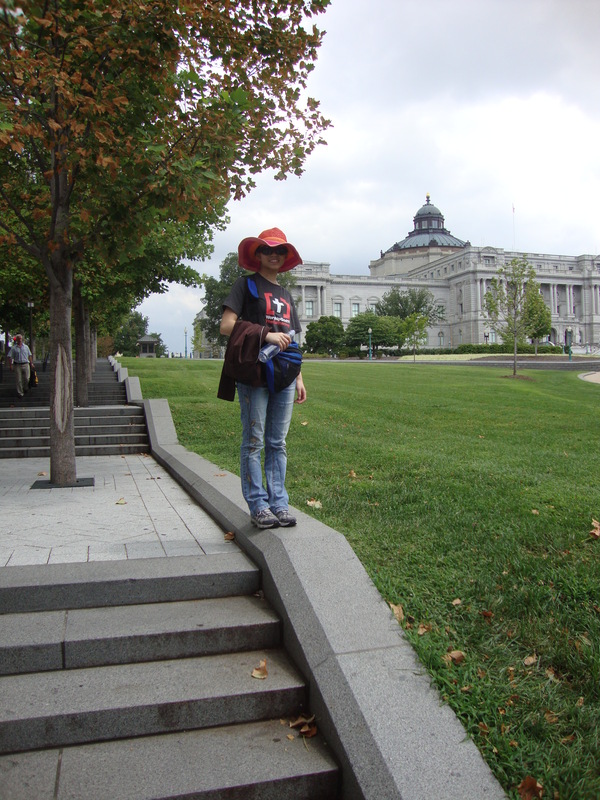 At the end of the day, we still didn’t get enough time to see everything else D.C. had to offer – there was just too much do to, and not enough time! It was less stressful travelling home. By now we’d gotten the hang of driving on the right side of the road, as well as using the GPS navigation system. Driving back to the airport was the most hilarious part, as the GPS kindly took us through some scenic country route which included a ride on a historic ferry crossing. Picture us driving in our car, and then hearing the voice on the GPS say, “Take a right turn. Then board ferry.” It was a brief moment of sheer panic, then sheer hilarity ensued! Grateful to God for even small memories like this. Flying back was easier this time – no delays, our luggage was checked all the way through, and we got to bring our guitar and mandolin through customs without any problems! Our friend who had been house-sitting picked us up and we enjoyed reacquainting ourselves with NZ again. It’s good to be home!!!! So it’s been a few weeks now since the conference, and we’re back in our day-to-day lives. Could we sum up what we’ve learnt and experienced? I don’t know – it seems like an impossible task! Q1. Of all the conferences out there, why this one? Bryan Chapell says, “Where the gospel is honoured, it shapes worship.” That statement has proven true for as long as Christians have been meeting. Every meeting tells a story, and the story we’re supposed to be telling is clear. We gather to rehearse, celebrate, and respond to the gospel of the crucified and risen Saviour, Jesus Christ. Ultimately, we wanted to go to this conference to be better equipped to serve our church family – but also learn ways in which we as a church can better take part in serving each other when we meet together. Q2. What was the overall format of the conference? The Conference was 4 days. 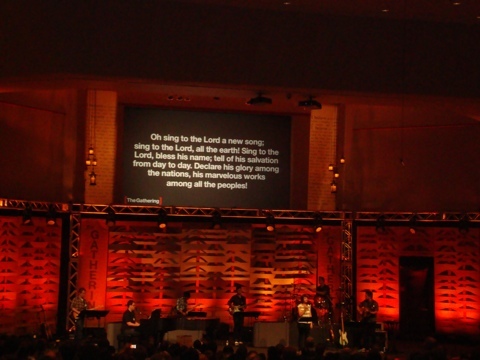 There were 1 or 2 main sessions each day which was led by various bands from Sovereign Grace Churches, Grace Community Church, and Sojourn Community Church. we worshipped in song, Scripture reading, prayer, and hearing Gods Word preached by Ray Ortlund, Bryan Chapell, Thabiti Anyabwile, Bob Kauflin and Craig Cabaniss. They each taught about a different facet to what Christians should do when we meet together. On some of the days we got to attend more specific training seminars. There were ones for worship leaders, singers, songwriters, instrumentalists, sound crew, choir directors… and some just for any worshipper (e.g. praying, simplifying your spiritual life). Basically anything to do with helping Christians to better worship God. And we also got to sing in a conference choir together for one of the sessions, and sing in a live album recording, with new songs written around the different reasons why we meet together as Christians. Q3. What’s something from the General Sessions that has left a profound effect on your heart & mind? All of it left a profound effect!! These were messages that any worshipper of God will benefit and be encouraged by, and can be found on the Sovereign Grace Ministries website. 1. Our meeting together is more than just good teaching with application, but it’s a supernatural, miraculous event where Jesus is displayed as glorious and, transforms us into His likeness. 2. Our meeting together is more than just an ad hoc order of service, but a time to rehearse the gospel in everything we do. 3. Our meeting together is not about what we want to teach or accomplish, but submitting ourselves to God’s Word and what He wants to teach and accomplish in His church. 4. Our meeting together is not only about our individual relationship with God, but a time to serve one another and build each other up through Christ. 5. Our meeting together is not the pause button or escape for our mission – but part of our mission in proclaiming Christ to a dying world. Oh, and, I loved the reminder from Thabiti during his talk: “if you have a public role, at some point you’re going to do something stupid.” – that humbles us! Q4. William & Cheryl: You both attended different workshops; give us two principles or concepts that your found particularly helpful/practical. 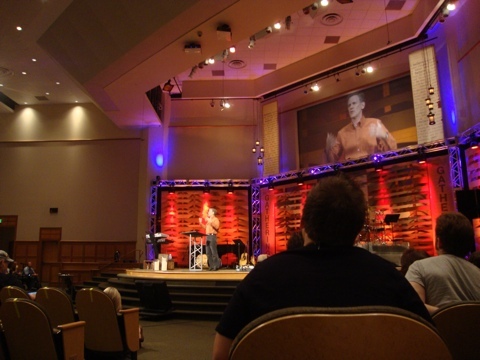 Sound seminars: So much helpful technical stuff for me (Cheryl) personally, but one principle – the sound volunteer’s main focus is to facilitate relationship-building between the church and God, the church and each other. Any tweaks, changes we make technically are secondary to our relationship with others, and building each other up in Christ (Eph 4:29). Most importantly, we want to thank you (our church family) all for your prayers and encouragement – we’re so thankful to God for granting us the opportunity to go. Everything we’ve learnt has impacted and changed us, and will hopefully bear fruit in our life and service, benefit us as a church family, and glorify our Saviour for years to come. Over the next weeks we plan to share more specific things that we’ve learnt with the musicians and the wider church body, and by God’s grace hopefully He’ll grow our church in the area of worship. Thanks for following our journey! Here’s the full series of our time in the USA. This entry was posted in Events, William and tagged conference, holiday, worship music, WorshipGod 11 on 29 August, 2011 by W C.
Our learning and growing didn’t stop after the conference. We attended one of Covenant Life’s morning services, had lunch with our UK friends, and checked out music instrument and guitar stores. We learnt just as much on Sunday as any of our days at WorshipGod 11. Firstly, we got to obsere first-hand how their regular Sunday services were put together. Before the start of the service, one of the pastors (they have quite a few) led a pre-meeting prayer time. People are encouraged to come to the front of the auditorium, and pray together with the help of a particular passage of Scripture (this morning it was Phil 2). The pastor then opens the time in prayer. Next, we sing two songs led by one of the church’s music teams, all contemporary bands. This morning it was led from the piano by Ken Boer (with guitars, bass, drums, synth and two vocalists). One of the pastors come up to give any important notices (most were kept on noticeboards outside and on the website) and welcome any visitors. Each visitor was given a pen, a small bulletin-brochure with key church information and a guest card tear-off, and a CD with some essential Sovereign Grace songs. A very practical gift for first-timers. The offering would be taken, at which there may be more singing before someone comes up to teach from Scripture. Then there are one or two songs before the service concludes. 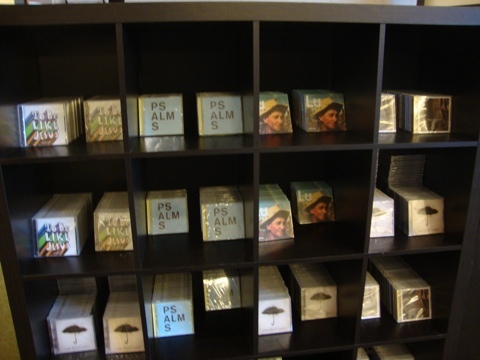 (A list of songs used on Sunday morning is made available on the Covenant Life Music and Worship blog. While I learnt much about service structure etc, this was definitely not a normal Sunday morning. Some of you may know that Covenant Life Church is currently involved in a painful controversy that involves one of their founding pastors, CJ Mahaney, and the wider Sovereign Grace movement. We were moved to tears as through the meeting the pastors devoted much time during the gathering to address these issues the church is going through. I cried as I thought of how in the midst of their troubles, they still gave to us so generously by hosting this conference, modeling our generous King. During the sermon, senior pastor Josh Harris taught from Colossians 3:9-15 and reminded us not to forget the big picture: our identities, and those of brothers and sisters we disagree with, are in Christ, not in the issues we disagree on. Please keep Covenant Life Church in your prayers. After the morning meeting we said more goodbyes to people we’d met at Covenant Life, and then headed over to a a nearby suburb for some tasty crepes and ice creams with Fran and Matt Richley. It’s been wonderful to meet these two blokes, and we wish we would be able to see them one day in the future. Cheryl loves many things Welsh so it’s a strong possibility we’ll plan to head there one day if the Lord wills. We spent a relaxing afternoon and evening buying requested items for friends, before exploring the local supermaket (this one was called Giant). 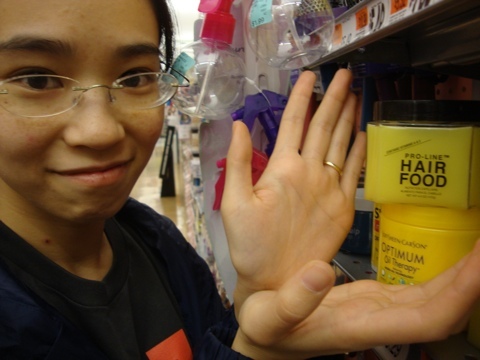 There are so many weird things on sale that it was an experience in itself for us! 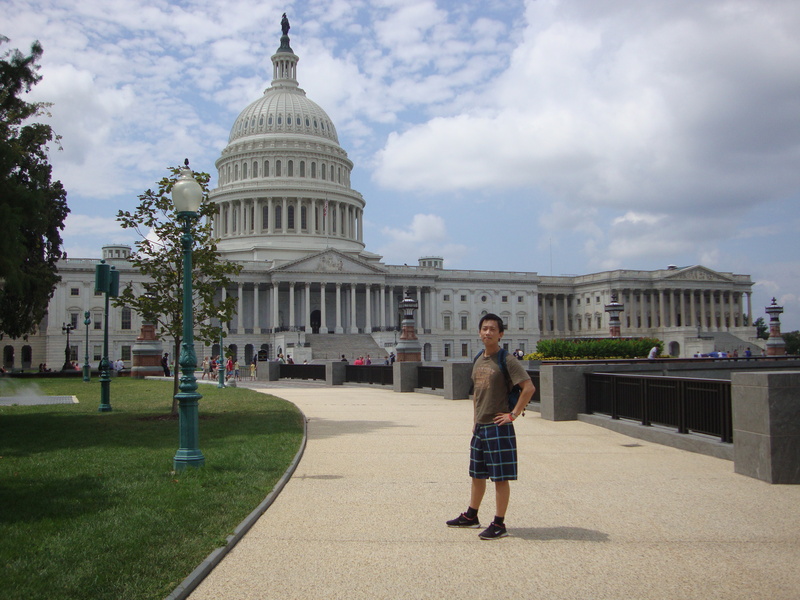 Update (26/08/2011): here’s the full series of our time in the USA. This entry was posted in Events, William and tagged conference, suffering, WorshipGod 11 on 17 August, 2011 by W C.
Just before the conclusion of the conference, Bob sang a spontaneous song to encourage the younger attendees (here’s the video). After lunch, we went shopping for musical instruments. Cheryl bought a mandolin, while I got an acoustic guitar. Instruments are much cheaper here than in NZ, so hopefully this guitar will better serve our church when I’m playing guitar in future. Lord willing we may see a mandolin being played one Sunday morning in the future! Randall has served as worship pastor at Cherrydale Baptist Church in Arlington, Virginia for a number of years. He was very gracious to us and we enjoyed having lunch with him and talking about the Baptist denomination and other issues. We’re praying for him and his church as they are going through some contentious issues with their congregational-governed membership. Amy is a young woman who recently had to quit her job because it couldn’t even pay for the petrol it takes to get there. She goes to the Sovereign Grace church led by Craig Cabaniss in Anna, Texas – and we are praying that she would be able to get a job soon as a vet assistant. 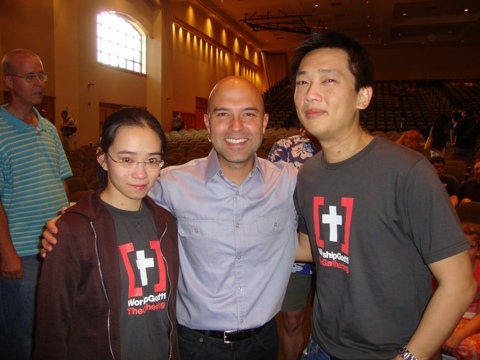 We’ve been so blessed to meet and get to know so many like-minded lovers/followers of Christ. This entry was posted in Events, William and tagged conference, holiday, Worship leading, worship music, WorshipGod 11 on 16 August, 2011 by W C.
Day 3 of WorshipGod 11. One general session, two more seminars, and an evening of singing for a live album recording. We worship a generous King, showering kindness on us! For the morning session, the worship was led by Sojourn Music. Their songs have a unique indie-folk sound to their songs, and lead using a neoliturgical style, incorporating elements such as responsive reading and structuring the songs using the gospel (from adoration, to confession of sin, to the work of Christ, to assurance of peace etc.) Very fascinating and fresh take on many of Isaac Watt’s hymns. I would particularly commend the song “Absent From Flesh” from their latest album, The Water and the Blood. 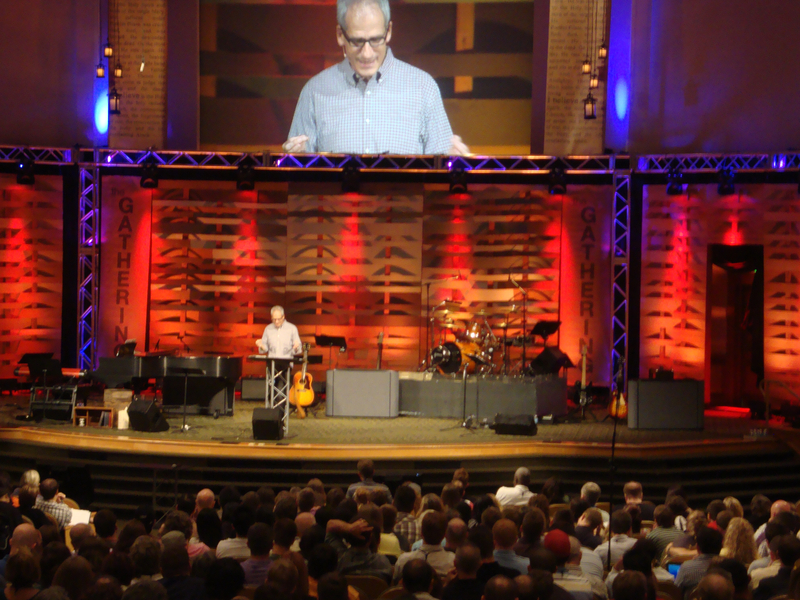 This morning, Bob Kauflin taught from 1 Corinthians 14:1-33. Rather than explain a particular view of spiritual gifts, he tried to show that the Apostle Paul’s main idea through this passage is to encourage the divided, self-centred Corinthian church to ensure that what we do in our gatherings edify, or build up each other. Not only that, God is the one who edifies His church when we gather. Another helpful message with very practical implications on how we organise our church services – for example, do we provide some way for the congregation to build each other up (whether planned or spontaneous)? 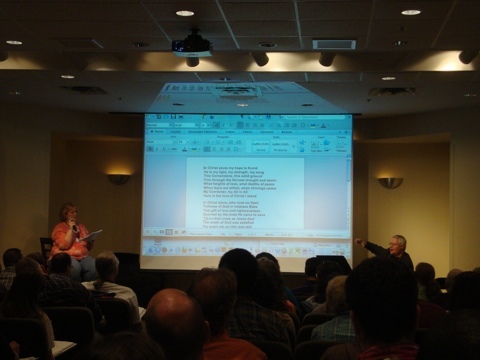 In a seminar titled “What Makes These Songs Great?”, Steve and Vikki Cook (writers of memorable songs like “Glories of Calvary”) walked through the melodic and lyrical features that help to make a worship song that stands the test of time. I found it helpful as it was the first teaching on songwriting I’d heard that pursued musical and lyric excellence not for it’s own sake, but so that it better communicates and shares the life-giving message of Jesus. It’s also sparked a dormant interest in my own feeble attempts and songwriting. In this seminar, Ken Boer (Music Director at Covenant Life Church) gave helpful principles and ideas for how to organise a growing ministry team – this was very practical and covered things like personal productivity and organisation, timekeeping, team organisation, and leadership of ministry teams. I hope there’s things I can learn from this to better serve our teams back at Howick Baptist. Recording the live album was fantastic. We sang through fifteen songs that trace the shape of a corporate gathering. The songs went from adoration, to confession of sin, to proclaiming the work of Christ, to assurance in our struggles, to preparing for the preaching of the Word, to remembering the Lord’s Table, to a sending off/benediction. The music was tight, the lyrics we were singing were all gospel-focused and gave truth in fresh words and phrases. My voice became really hoarse from singing praises to God so much. I kept thinking, imagine how wonderful it will be in Heaven to have glorified bodies to not only have the desire, but also the ability to praise the Lamb upon the throne forever! We’re looking forward to when the CD comes out, approximately in November. In addition, they recorded lots of footage on camera so there will likely be video as well. How exciting that this could help to spread gospel-rich, life-changing songs! 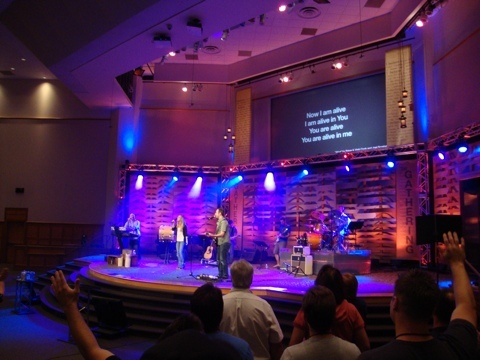 This entry was posted in Events, William and tagged conference, holiday, sovereign grace, sovereign grace music, Worship leading, worship music, WorshipGod 11 on 15 August, 2011 by W C.
Day 2 of WorshipGod 11. A full day of 2 general sessions and 2 seminars, as well as dinner with a family with strong NZ connections. Wow, thank you Lord for such an amazing day! Rich Gunderlock and the Bairds led us in singing this morning. This included some songs they had written, including “Completely Done”. I appreciated the way they pointed to Jesus through singing, praying, Scripture reading and words of encouragement. The teaching this morning was from Bryan Chapell. He’s written a book called “Christ-centered Worship” which I’ve bought, look forward to reading it soon! 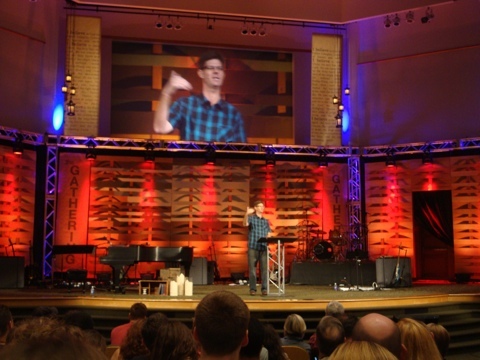 Bryan Chapell taught from Isaiah 6 as a picture or rehearsal of the gospel, and how it can inform the way our services can similarly help us to rehearse the gospel progression: from glory, to grace, to mission. We split up and attended two seminars during the afternoon. The first one (run by Bob) covered principles and suggestions when thinking through how to choose songs. There were plenty of really good ideas and things to consider – will be looking forward to see how to apply them when I’m choosing songs in the future. 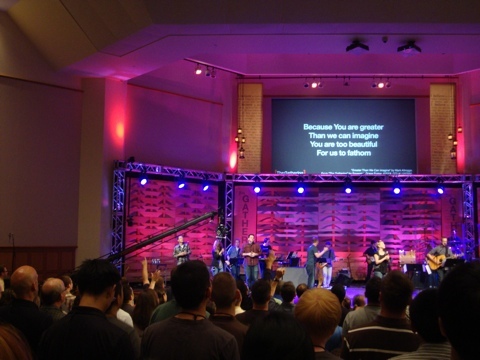 The next seminar was even more interesting – a few worship bands signed up to play a song each. Bob gave feedback, encouragement and constructive feedback. What was particularly valuable was some of the comments about band dynamics, voicing, arrangements etc that Bob gave from his accumulated experience with contemporary praise bands. 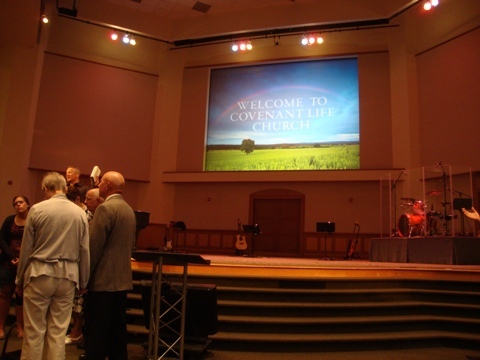 Two workshops by Doug Gould, a sound technician at Covenant Life Church, were very helpful. Lots of good explanations for how to reduce stage noise, how different types of microphones work and what they’re useful for, and more. These are workshops and learnings our own sound engineers at HBC would be blessed by. For the evening session, Thabite Anyawile – the Caribbean Spurgeon – brought the Word to us from 1 Timothy 4, emphasizing that the Word of God is to be central in our preaching. I would recommend this message in particular to both pastors and worship leaders, as there are principles and applications for both. If the Word is to be central in our gatherings, both should be on the same page! The worship in song tonight was led by Enfield – and the energy and zeal they had was AWESOME! 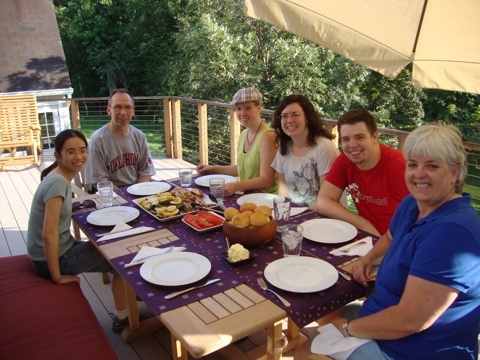 We got to have dinner with a family who have a special love for New Zealand. Susan Perdue spent some time in Taranaki as an exchange student in NZ, and still have special connections with her adopted parents that she stayed with. Philip and Susan have three children who are all very talented musicians – their eldest son, Chris, showed me his mandolin – what a neat instrument! It’s a fascinating experience being in a church where there’s a traffic cop to direct traffic in, and where there’s traffic jams after each session. wow. 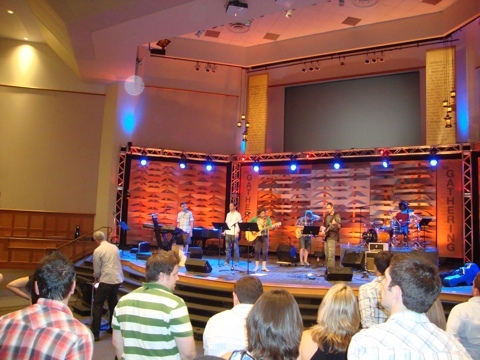 This entry was posted in Events, William and tagged conference, gospel, music, sovereign grace music, Worship leading, worship music, worship songs, worshipgod, WorshipGod 11 on 14 August, 2011 by W C.